Greg Tacker sent in this one. "I marched in the Memphis Blues drum line in 1982. My 11-year-old, Colin, and I were in Murfreesboro again this year. The next night we were in Indianapolis. After the show, we made the rounds in the parking lots and I took this one of Colin at one of the buses. 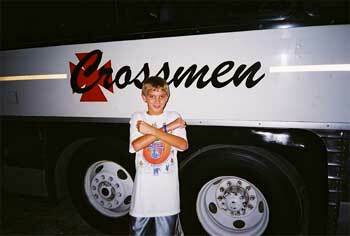 Do you think he likes the Crossmen? We had a great time at both shows and will be there again next year!" Thanks Greg! E-mail your best shots from the summer to forzato@dci.org along with where and when the photo was taken. Send some biographical information about yourself as well. We'll give you full credit. Also, let us know if you want your e-mail address included.